There exist several methods and a fairly substantial literature on the field of age estimation. However, different methods are associated with varying degrees of uncertainty and precision, and this is not always well understood. From a statistical-methodological point of view, there are reasons to believe that a combination of different measurement methods and a more conscious use of the relevant statistical methodology may provide more reliable estimates and better quantification of associated levels of uncertainty. When the uncertainty is known, considering the acceptance level of the error rates, methods are to be found out to rectify it to the maximum possible extent to make it in acceptable limits with maximum validity as there are no methods, by which the age of an individual can be precisely estimated. Introduction: The monitoring of intracranial pressure (ICP) in traumatic brain injury (TBI) is important for postoperative care. In our clinical practice, we have found that neurological deterioration because of contralateral epidural hematoma (EDH) occurs despite normal ICP in patients who have undergone decompressive craniectomy (DC). This study was performed to elucidate the dilemmas associated with ICP monitoring after DC and the possible complementary role of intraoperative and immediate postoperative imaging studies. Methods: Patients who had received DC due to TBI during a 7-year period were retrospectively identified from our database and evaluated. Logistic regression analyses were used to evaluate the associations between patients. Results: Twenty patients had contralateral skull fractures. 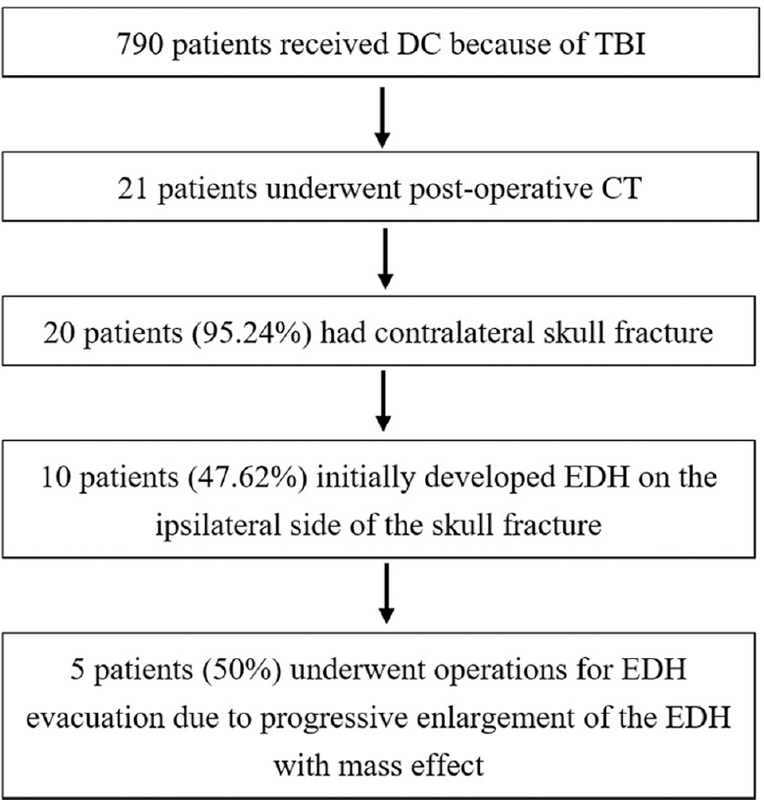 Five patients (5 of 10, 50%) who developed EDH on the ipsilateral side of the skull fracture underwent operations for EDH evacuation due to the deterioration of their clinical condition. The ICP was significantly lower (P = 0.016) in these patients compared with patients who did not undergo secondary surgery due to EDH. Conclusions: ICP monitoring alone cannot absolutely ensure early detection of contralateral space-occupying lesion after DC due to improvement in cerebral compliance. Imaging studies using brain computed tomography is beneficial for early detection of delayed EDH after DC in a high-risk skull fracture with contralateral acute subdural hematoma patients. Background: High-grade primary gliomas are aggressively growing and have an unfavorable prognosis. The utility of prognostic biomarkers of outcome in glioma patients is important for medical practice. Cell division cycle-associated 7-like (CDCA7L) protein modifies cancer progression and metastasis. Nevertheless, its character in defining the clinical prognosis of human gliomas has not been illuminated. Subjects and Methods: The hypothesis of this study was that CDCA7L is upregulated in human gliomas. We studied two de-linked data from Gene Expression Omnibus (GEO) profile. The first dataset (GDS1816/225081_s_at/CDCA7L) in primary high-grade glioma included age, gender, and survival time. Another dataset (GDS1962/225081_s_at/CDCA7L) was also encompassed to estimate CDCA7L gene expression in each pathological grading. Search Tool for the Retrieval of Interacting Genes/Proteins (STRING) was used to survey the protein-protein interaction (PPI) network of CDCA7L-regulated oncogenesis. 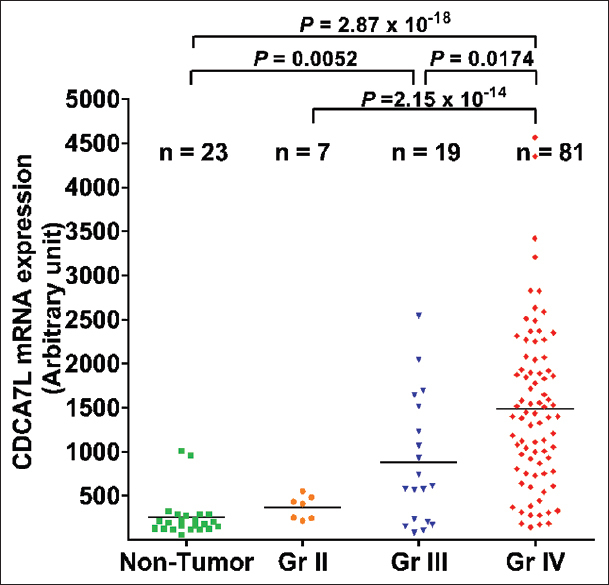 Results: Statistical analysis of the GEO profile revealed that the World Health Organization (WHO) Grade IV (n = 81) gliomas had higher CDCA7L mRNA expression level than in Grade II (n = 7, P = 2.15 × 10 −14) gliomas and nontumor controls (n = 23, P = 2.87 × 10 − 18). Kaplan-Meier analysis reported that patients with high CDCA7L mRNA levels (n = 49) had adverse survival than those with low CDCA7L expression (n = 28). The PPI analysis of CDCA7L-regulated oncogenesis showed CDCA7L as a potential hub protein. Conclusions: The expression of CDCA7L has a positive correlation with the WHO pathological grading and shorter survival. This finding suggests that CDCA7L may be a potential biomarker of prognosis in human gliomas. Background: The multidrug-resistant Gram-negative bacteria (MDRGNBs) have emerged as important pathogens recently. Cefoperazone-sulbactam is active against a great proportion of those MDRGNBs. However, the susceptibilities data of cefoperazone-sulbactam are lacking in Taiwan. Object: This study was conducted to evaluate the susceptibilities data of cefoperazone-sulbactam aganist commonly encountered clinical pathogens in Taiwan. Materials and Methods: 2272 isolates were collected from various clinical specimens from five centers in Taiwan in 2012. The agar dilution method was used to evaluate the susceptibility of the isolated pathogens to cefoperazone and cefoperazone-sulbactam. Result: cefoperazone-sulbactam showed better activity against various GNBs, including MDRGNBs and part of carbapenem-resistant isolates tested compared to cefoperazone alone. Conclusion: Cefoperazone-sulbactam is active against most commonly encountered clinical pathogens, including MDRGNBs and part of carbapenem-esistant A. baumannii complex. It can be a potentially therapeutic agent for treating infections caused by these pathogens in Taiwan. Background: Cardiopulmonary bypass (CPB) induces postoperative immunosuppression, including decreased T-cells and lower plasma regulated on activation, normal T-cell expressed and secreted (RANTES) concentrations. MicroRNA-125a negatively regulates RANTES expression in activated T-cells. The aims were to investigate microRNA-125a expression in T-cells and RANTES production following CPB. Materials and Methods: Twenty-eight patients undergoing elective cardiac surgery were included in this study. Arterial blood was sampled at six sequential points (before anesthesia induction, before CPB, at 2, 4, 6, and 24 h after beginning CPB) for plasma RANTES concentrations by enzyme-linked immunosorbent assay. T-lymphocytes were isolated from whole blood at four points (before anesthesia, before CPB, at 2 and 4 h after beginning CPB) for intracellular microRNA-125a expression by quantitative real-time reverse transcription polymerase chain reaction in 14 patients. Perioperative laboratory data and variables were also recorded. Results: The plasma RANTES concentrations decreased significantly at 2-24 h after beginning CPB, with concurrent reduction of postoperative lymphocyte counts, as compared with the preanesthesia level (P < 0.001). Intra-T-cell microRNA-125a expression was activated at 2 and 4 h, however, without significance (P = 0.078 and 0.124, respectively). 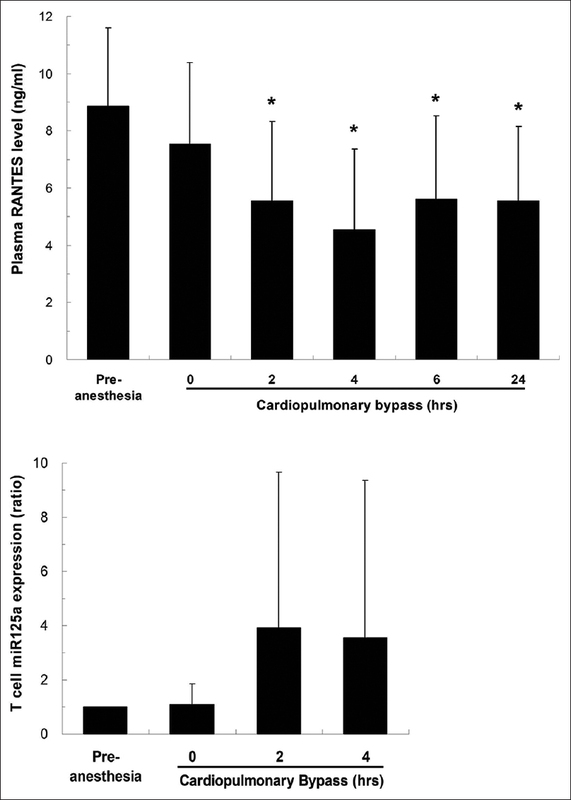 The plasma RANTES levels at 4 h were not correlated with CPB time (P = 0.671), anesthesia time (P = 0.305), postoperative extubation time (P = 0.508), and Intensive Care Unit (ICU) stay (P = 0.756). 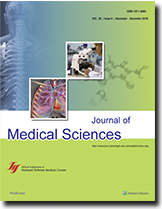 Three patients expired with pneumonia- or mediastinitis-related septic shock in the ICU. Conclusion: Plasma RANTES concentrations were depressed till 24 h following CPB, with reduced lymphocytes after cardiac surgery. MicroRNA-125a expression in T-lymphocytes was not correlated with perioperative variables and its role in downregulation of RANTES production needs to be determined. The knowledge of variations in the vascular architecture of hand is of great importance to surgeons, orthopedicians, and plastic surgeons in microsurgical procedures following crush injuries of the hand and amputations. The efficiency of collateral circulation in hand is essential in few peripheral vascular diseases like Raynaud's disease and harvesting of the radial artery for the coronary bypass graft. 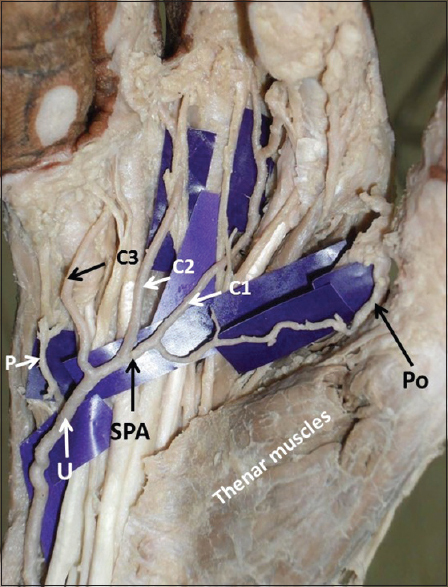 During routine dissection of the right upper limb of a 55-year-old male cadaver, we observed that the superficial palmar arch (SPA) is formed by the ulnar artery and completed by the first dorsal metacarpal artery. After completing the arch, dorsal metacarpal artery continued as princeps pollicis artery for the thumb. The common palmar digital artery supplying the contiguous side of index and middle fingers passed through the neural loop formed by the proper digital nerve supplying the radial side of the middle finger and joined with the unusually large first palmar metacarpal artery before dividing into proper digital arteries. The first palmar metacarpal artery also gave origin to radialis indicis artery which in turn ran deep to tendons of the index finger to reach index finger. The common palmar digital artery supplying the contiguous side of middle and ring fingers also passed through the neural loop formed by the proper digital nerve supplying the ulnar side of the middle finger. The deep palmar branch of ulnar artery gave proper digital artery to little finger. The combination of iliopsoas tendon impingement and snapping hip syndrome with persistent hip pain is rare in patients following total hip replacement (THR). Diagnosis should be made by clinical physical examination, with the exclusion of complications following THR by imaging or laboratory studies. Accurate diagnosis and adequate treatment can result in an excellent outcome and patient satisfaction. Hip arthroscopy can resolve both iliopsoas tendon impingement and snapping hip syndrome with minimally invasive surgery, immediate improvement, and rapid recovery. Fungal endocarditis is a very rare entity and is associated with high morbidity and mortality rates. 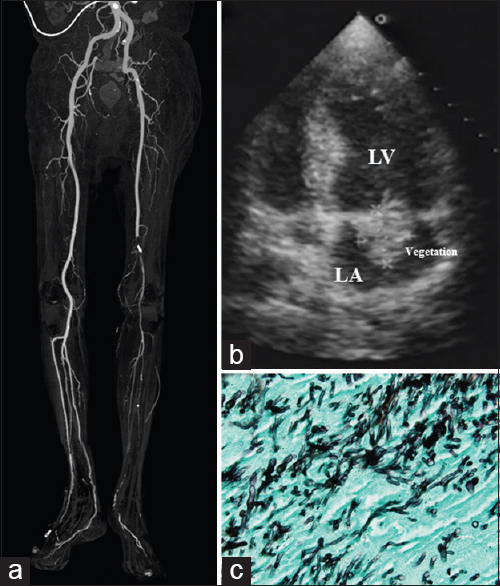 We report a 68-year-old man with fungal valvular endocarditis over the mitral valve with a large vegetation located over the anterior leaflet, presenting initially as acute limb ischemia of the left lower limb. 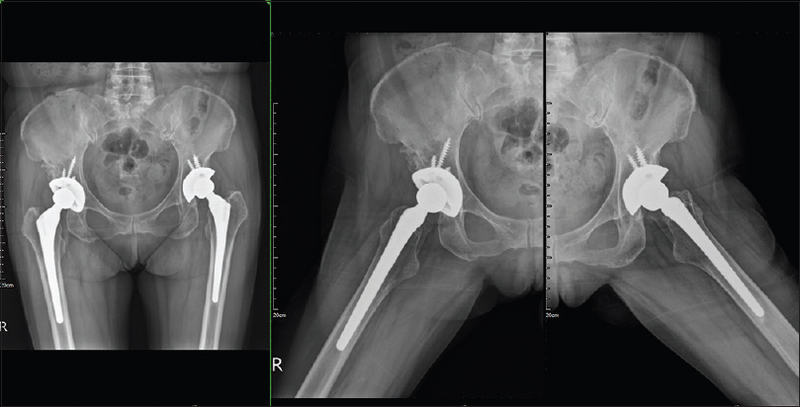 Immediate embolectomy was performed for revascularization of the left lower limb. Pathologic section of the retrieved femoral embolectomy specimen revealed aggregated fungal spores and hyphae. Blood cultures were positive for Candida tropicalis. We should be alert to treat patients with acute arterial occlusion of the extremities and to investigate the underlying possible fatal etiology. Spinal cord ischemic injury and consequently permanent paraplegia remain the most devastating complications after open and endovascular thoracic or thoracoabdominal aortic aneurysm repair. Hemodynamic stability, which depends on a network of blood vessels around the cord, is most important not only during but also after stent-graft deployment to prevent spinal cord injury. Despite the use of various strategies to prevent spinal cord ischemia, including aggressive revascularization of the subclavian artery and cerebrospinal fluid drainage, this condition remains inevitable and difficult to predict before an operation. We present a rare case of a patient who presented with unilateral paraplegia that developed after thoracic endovascular aortic repair for aortic arch aneurysm and our subsequent salvage strategy.